Worldwide Ransomware Crisis - Wanna Cry Ransomware - Self Inflicted? You are here: Home / Blog / Cyber Crime / Worldwide Ransomware Crisis – Self Inflicted? 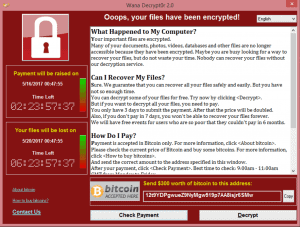 By now, most people would have heard about the Worldwide Ransomware attack that employed the virus called Wanna Cry. Some 200,000 computers across many counties worldwide have been affected including the NHS in Britain, the National Railway in Germany, FedEx in the USA and Spain’s National Railway system. It has caused mayhem among some very large Institutions like those I have mentioned. Well it would seem to me that this is largely self inflicted. Microsoft released a Patch back in March that addressed the vulnerability that allowed this virus to be effective. So all supported Operating Systems, Windows Vista and on, had they been patched, were protected. But there were many PC’s still running Windows XP that were targets. Now you tell me, when Microsoft ended support for Windows XP, there were plenty of warnings and messages that support was ending. So why in the world would you continue to use obsolete, unsupported software for Critical Systems? Like I said, self inflicted. And I suspect that those in charge of IT at some of these places will have a lot to answer for and may well lose their jobs. Let’s look at the Home User now. Much the same applies. You must always download, and install the Patches released by Microsoft. They release these Patches for a reason. In addition, do not continue to use PC’s with outdated Operating Systems like Windows XP. Let’s face it, we had a pretty good run with Windows XP. It first appeared in August 2001, and it was supported right up until April 2014. So people certainly got their money’s worth. Now it’s time to move on. But if you MUST have Windows XP because of some software you run will only work on XP, then at the very least, do not have it connected to the Internet. But if you absolutely and positively need it connected to the Internet, then please make sure you have good Security Software installed and you don’t go downloading dodgy things or visit dodgy websites, and certainly be very careful about opening or even using email on that PC. Spotty Dog Computer Services offers Ransomware Removal services.